The Mayans said 2012-12-21 is the end of the world. With that scary thought in mind, I prepared my proposal to my girl. I hope to claim a resounding success before the world falls apart. And if I fail, at least there’s not much time to live in shame. It took me 3 months to secretly prepare. Then while we were on a holiday in loveland Jeju, on the last day of our world, I popped the question. And the world didn’t end. So I lived to tell the story.. Here’s what I did. I created Ask Something, an iPhone app that is like the game Draw Something, but instead of drawing, you ask and answer question in a turn-by-turn fashion. It’s NOT yet available in the App Store. I lied to her this is a game created by my friend, which I promised to help to test. It is also a good game since we are used to such game with traditional pen and pencil. What she doesn’t know is that the game has an easter egg. I asked the special question on the last day of our world. Before she can answer the question, she has to watch a video first. Then she can choose Yes or No. 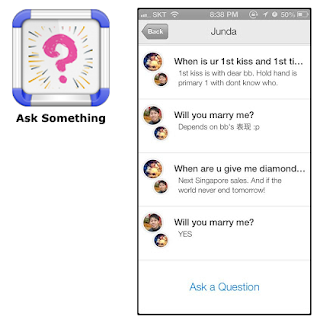 When she choose Yes, the app will post a link (http://mrs-ong.com) and share on her Facebook wall. This helps to mark the exact time that she said Yes, and her friends get to visit the website to find more. Creating a music video is the hardest. I am a geek who knows how to develop mobile apps and websites. But creating a music video? I have zero experience in video production, and has no talent for singing.. Yet, you must do something shocking for proposal. So I shoot a music video titled “嫁给我 - by 俊达 for 吕晶”. Click here if you know me and don’t mind hearing my terrible singing. Alternatively, click here for a much better soundtrack. It’s quite embarrassing.. but I thought it’s the end of the world anyway, right? She watched the music video, giggled and very much touched. When the video ended and she saw “Will You Marry Me?”, she pressed Yes, immediately. She didn’t even ask for a diamond ring. And as you already know, the world didn’t end.